Not quite the soaring rhetoric of his illustrious forebear but succinct. Soames rightly was objecting to a Trump tweet that tried to link a 13 percent rise in the crime rate in England and Wales to radical Islamic terrorism, a notion that the president may have picked up from a conspiracy website. Words. 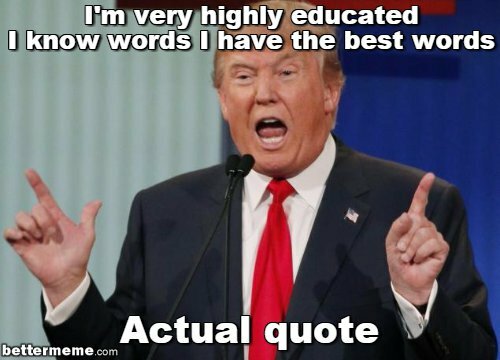 “I have the best words,” Trump famously proclaimed during the campaign, and just the other day he told Maria Bartiromo of Fox News how “well-crafted” his goofy tweets are. The same man announced from the White House lawn on Wednesday that “I’m a very intelligent person” — words that sounded more self-deceptive than presidential. 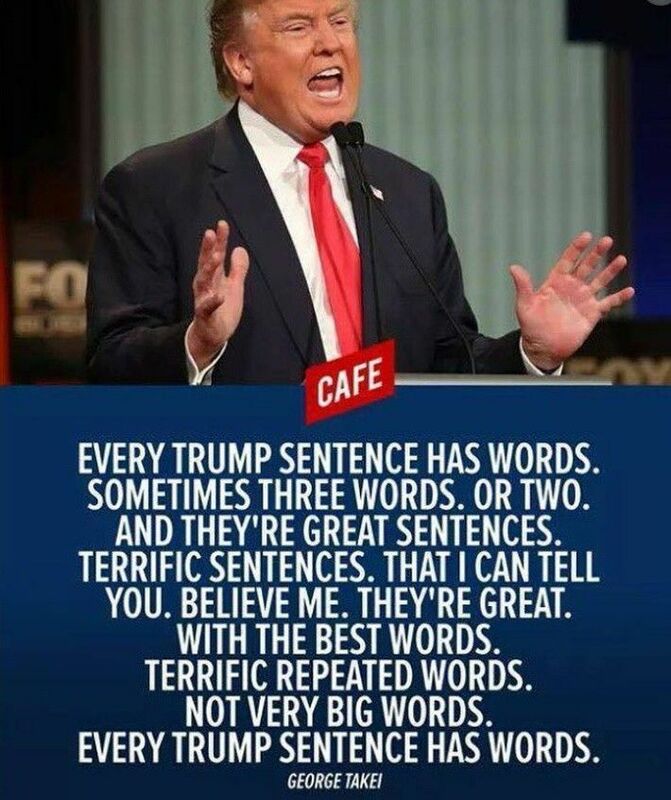 Trump does have a way with words. Unfortunately, it’s a gruesome way. His way is to use them as a blunt instrument to bully and belittle opponents. The rest of the time — when he’s not reading prepared remarks from a teleprompter — his way with English is fumbling, incoherent, reckless and untruthful. Look no further than the contretemps that began with his false claim that unlike him, “most other presidents” didn’t make phone calls to the families of military killed in action, which then rapidly nosedived even further, using the dead as a political football, then insulting the widow of a dead Green Beret hero and a Florida congresswoman. The president’s negligible grasp of his native tongue may be part of the reason we’ve been so taken the last couple of weeks by eloquent speeches from former Presidents Barack Obama and George W. Bush as well as Arizona Sens. John McCain and Jeff Flake, all of whom articulated — without mentioning Trump’s name — deep concern about the current state of the nation and the planet. We know that when we lose sight of our ideals, it is not democracy that has failed; it the failure of those charged with preserving and protecting democracy… Our governing class has often been paralyzed in the face of obvious and pressing needs. The American dream of upward mobility seems out of reach for some who feel left behind in a changing economy. Discontent deepened and sharpened partisan conflicts. Bigotry seems emboldened. Our politics seems more vulnerable to conspiracy theories and outright fabrication. The connection between the pair may not be obvious — the men came from opposite ends of the political spectrum; one was flamboyant and public, the other more circumspect and private — but they were two of the 20th century’s great rhetoricians. The heart of both men’s stories is in the same crucial period from the rise of the Nazis until the aftermath of World War II. In this period, when so many gave up on democracy as a failure, neither man ever lost sight of the value of the individual in the world, and all that that means: the right to dissent from the majority, the right even to be persistently wrong, the right to distrust the power of the majority, and the need to assert that high officials might be in error – most especially when those in power strongly believe they are not. During the war, Churchill’s words rallied Britain and the United States in the fight against fascism. And so we have Donald Trump, who even in his muddled syntax and circumlocution still manages to convey a message that fosters anger and fear while eschewing the facts. Orwell lays it out in 1984: “The Party told you to reject the evidence of your eyes and ears. It was their final, most essential command.” All is fake news. When Trump became president, he moved back to the Oval Office a bust of Winston Churchill. Doubtless, he regards the sculpture as a symbol of intrepid conservatism and resolve, or at least someone told him that. In some respects, a bust of George Orwell might be more appropriate, a reminder that this president already has brought to life some of the author’s darkest fantasies. In Trump’s Newspeak world, a climate denier is put in charge of the EPA, a foe of proper public schooling heads the Department of Education and unfortunate truths are wiped from official websites and tossed into the memory hole.